Authorities lifted Thursday’s order to remain indoors after several hours, saying tests showed the elevated levels of benzene in the air had cleared. But that was little solace to residents who watched for three days as a giant plume of black smoke billowed from the plant, leading authorities to close neighborhoods and cancel classes at area schools. “It’s pretty harrowing,” said Jeff Fountain, a chemist who lives with his wife and three children about four miles (6.4 kilometers) from the plant. Authorities haven’t revealed the cause of the blaze. They said Wednesday that the benzene levels near the facility didn’t pose a health concern, but they issued the shelter-in-place order early Thursday due to “reports of benzene or other volatile organic compounds” in Deer Park, which is about 15 miles (24 kilometers) southeast of Houston. 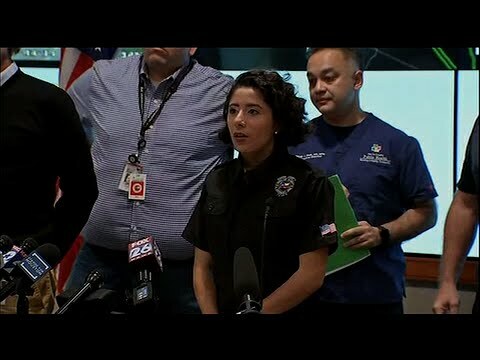 Harris County Judge Lina Hidalgo, who is the county’s top administrator, said at a news conference that light winds had helped keep the vapors from spreading more broadly. “The most important thing is that the levels that have been detected are still not high enough for the level of concern that people may be having,” he said. Intercontinental Terminals Co. spokeswoman Alice Richardson said Thursday company officials believe winds shifted foam that had been sprayed over one of the tanks which burned in the fire, allowing benzene vapors to escape. Late Thursday, officials with the nearby Deer Park, La Porte, Galena Park and Sheldon public school systems announced that all classes Friday were canceled for fear of a recurrence of Thursday’s shelter-in-place alert. A unified command has been set up to coordinate the efforts of Deer Park city and Harris County workers, along with those of the Texas Commission on Environmental Quality, the U.S. Environmental Protection Agency and U.S. Coast Guard. They are evaluating the environmental aftereffects on waterways surrounding ITC of the fire and efforts to extinguish it. The EPA and the TCEQ said Wednesday that they were waiting for test results of water samples to determine any potential impacts from the foam used to fight the fire on Tucker Bayou, Buffalo Bayou and the Houston Ship Channel. The Texas National Guard’s 6th civil support team was assisting at the scene Thursday. The team of about a dozen was helping to contain hazardous materials and provide other assistance to local emergency responders. The EPA conducted air quality tests throughout the Houston area, both on the ground and from a small airplane, and “measured no levels of hazardous concentrations,” EPA official Adam Adams said Wednesday, hours before officials imposed the shelter-in-place order early Thursday. “This issue isn’t over just because the fire is out. We want systems in place that will protect our communities,” Parras said Wednesday. Warren reported from Dallas. Staff writers Cedar Attanasio and Terry Wallace in Dallas contributed to this report.